This past Shabbat our congregation was touched by that which we never thought could happen to us. An early morning electrical fire destroyed our kitchen and the heat and smoke found their way to every corner of our sanctuary building. No space was left untouched by smoke or soot. And while the flames are extinguished the reminders of this tragic Shabbat morning linger. And they will linger for a long time to come. We find gratitude in that no one was injured. The building was empty on that early morning, February 15 and our Torah scrolls were relocated and are safe. Responses about the news still come from near and far with the same message of hope: ‘we are here to help however we can and thank God no one was injured.’ ‘It’s only stuff and stuff can be replaced, a life cannot.’ Yet still we mourn because while it is only “stuff” it is Our stuff that we take great pride in and love with all our hearts and souls. Our home has been touched by the flames of destruction and our hearts break. There are those of you in our congregational family who understand this all too well and I know this event opens wounds yet again. This week’s parasha is almost ironic, but then again, we experience that there are times in our lives that the Torah portion for that week is the one we need at this moment. Vaykahel is a beautiful story detailing exactly how the Tabernacle was to be built. With the artist’s direction of Bezalel and his partner, Oholiab, inspired by God, the people go to work creating the architectural plans and building to God’s exact specifications the place the people will gather, pray and learn. The details are breathtaking and the clear descriptions of the materials and colors used leap off the parchment. The people bring the treasured offerings to build the Tabernacle in great quantity. Everyone wants to participate, everyone wants to be a part of building not only God’s home, but their spiritual home. No one is left out and no one holds back their gifts. It is an expression of the ultimate love for community and peoplehood. We are the Israelites in the parasha wanting to come forward to bring our gifts. We are the Israelites today wanting to rebuild our syngagoue; our beit k’nesset, beit t’fillah, beit midrash – house of gathering, prayer and learning. And together, we will! Even in the midst of this tragedy there remains a beacon of hope still shining bright in our sanctuary. A light that needs no electricity, no power except that which God gives to us. Our ner tamid, eternal light, is still shining! Powered by the sun and unaffected by what has befallen us, the ner tamid calls us to remember that no matter what, no matter where, God is always here with us. God has not left us. If anything, God has protected all of us. 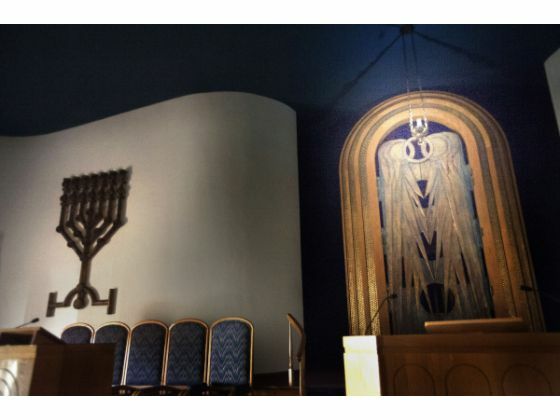 It is the beacon of hope to remind us that our congregation is not the building but rather the people who make up the Temple Beth Sholom family. We are a house of peace (Beit Shalom) and we will be a complete and whole house (Beit Shalem) again. May each of us hold on to the light of our ner tamid within our hearts and may we be strengthened to rebuild our home as our community is strengthened with the love we share for our congregational family. Kein y’hi ratzon – May it be God’s will and May it be ours! I am so saddened to hear about the fire. Sadly, I know how upsetting this can be to a congregation. May you and your congregation be strengthened by the process of rebuilding together. Thank you Anita! I feel the love of everyone through this. I have an amazing team who is working very hard right now. As for donations, yes, our website is a good place. We are also in the middle of a capital campaign, a silver lining in that we are going to move more quickly. Love to you too! We were very sorry to hear this news. May God bless your congregation and give you the resources and strength you need as you rebuild, repair, and recover from this tragic event.